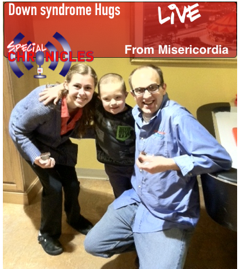 EDITOR’S NOTE: The following is a guest post from Daniel Smrokowski, Founder & CEO of Special Chronicles and an Athlete & Global Messenger for Special Olympics Illinois. Original article posted by The World of Special Olympics. In other words, the person is named before the adjective or descriptive phrase referring to the person. It helps to memorize a simple example such as: “instead of saying a blind man, say a man with blindness.” This is the type of people first language all news organizations should follow. On March 21st, we celebrated World Down Syndrome Day. The day helps us to see Down syndrome, and other disabilities, as a gift while focusing on an individual’s abilities. Just as the word “retard” or “retarded” (the R-word) is hurtful towards any of us with disabilities, it is also hurtful when journalists neglect using people first language. Often times in the media—whether it be headlines, articles, or brochures—writers will use the term “disabled person.” People may say it takes up more words to say “a person with an intellectual disability.” This is not an excuse. When readers read, “disabled” and then the person’s name, they see our disability first. Those of us with an intellectual disability, or any type of disability, want our society to see that we are a person first. The Associated Press is usually a credible source but at times they show a lack of understanding of people first language. On March 24, 2013, the Associated Press and MSN News published an article that read “Little progress on jobs for disabled Americans.” This is an example of failing to use people first language. Once a reader takes a look at the photograph that accompanies this article, the reader sees a girl who is in a wheelchair and working in an office. Even though someone may have a disability, that person brings a value to the work world and to humanity. When you do not accept, include, or hire us for a job, you are missing out. We have a lot to offer our world. On March 5th, thousands of people across the country joined in on the annual Spread the Word to End the Word campaign, an international campaign that promotes respectful people first-language. “If you use the words ‘retard’ or ‘retarded’ to explain something that doesn’t make sense, then I would say to you that you do not have a very good command of the English language and you can do better,” said Rob Johnson from CBS2 Chicago news. Georgia Hunter, 25, of Oak Park, Ill. sits smiling in the front seat of her mom’s car. She is brown-haired and is wearing a crisp button-down shirt with the embroidered Special Olympics Illinois logo. I am sitting directly behind her, wearing the same button-down shirt, a winter jacket, glasses, and a huge grin. Georgia, her mom, Karen, and myself were stopped at a red light. 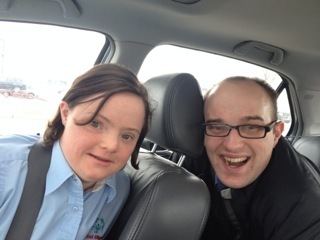 Karen snapped a celebratory photo just as we embarked on our trip home from Normal, Ill. We had just finished the March 8th Athlete Leadership Input Council meeting at the state headquarters for Special Olympics Illinois. 25-years ago, Georgia was diagnosed with Down syndrome. Her twin sister, Catherine, was not. Georgia works at Trader Joe’s and is soon to represent Illinois in aquatics at the 2014 USA Games for Special Olympics, to be held in New Jersey. 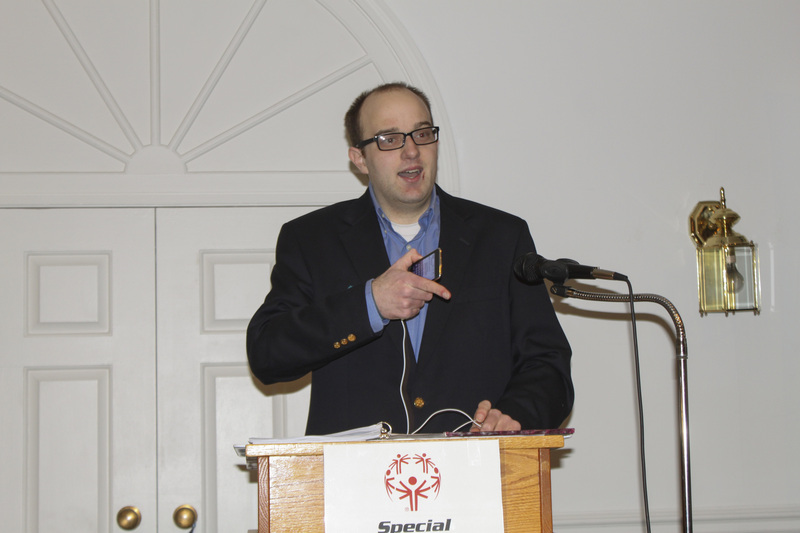 I too am an athlete and Global Messenger (spokesperson) with Special Olympics Illinois. 25-years ago, I was born three-and-a-third months premature and was diagnosed with learning disabilities and a severe language disorder. This means that it takes me longer to process information and to get words out. I process concepts differently than people who are not diagnosed with an intellectual disability. Despite this, in 2012 I received the Matthew Freeman Award for Social Justice from Roosevelt Univeristy. That same year, I received the Les Brownlee Scholarship from the Chicago Headline Club, and concluded 2012 with a Bachelor of Arts degree in journalism from Roosevelt. Because of the challenges that I’ve dealt with in my life and those of my friends diagnosed with various disabilities, the lack of people first language and the use of the “r-word” are hurtful to us, even when the word is not directed at us. I hope you will join us in choosing to use people first language to make the world a more inclusive place for everyone.